A super slicer that's perfect for any kitchen. It can cut regular slices at several thicknesses, dice vegetables in multiples sizes, chop long sticks for french fries, or give fruits and veggies a wavy or waffle finish. A knob on one side allows you to pop up vertical blades for julienne slicing at two different widths, and a knob on the other side allows you to dial in the perfect thickness. Switch out the regular straight blade for the one with the curvy edge to give vegetables ridges, or make waffle fries. Unlike other slicers, this one provides a whole range of thickness settings instead of a couple notches. Cut paper thin or extra thick, and anywhere in between. The remarkably sharp blade is made from surgical grade steel, and it's positioned at an angle to make it easy to cut any food. It comes complete with a safety holder to secure food, and protect your fingers, and there's an ergonomic handle at the top for comfort and ease of use. Notches on the bottom side allow you to attach it to a bowl while slicing, and it has feet that fold down for use on your counter. Don't struggle with a knife or waste money on more expensive tools. This affordable slicer will produce perfectly uniform results with very little effort, and it's totally dishwasher safe, so clean up is simple too. Versatile. For all of your fruit and vegetable cutting needs, this gadget does it all. Slice, dice, chop, julienne, shred, waffle and more. Adjustable. Just turn the knob to dial in the perfect thickness. This tool offers more settings than most, and allows you to choose from a range of thickness options. Sharp. With blades made from surgical grade metal, you are ensured a razor sharp edge to make slicing easy. 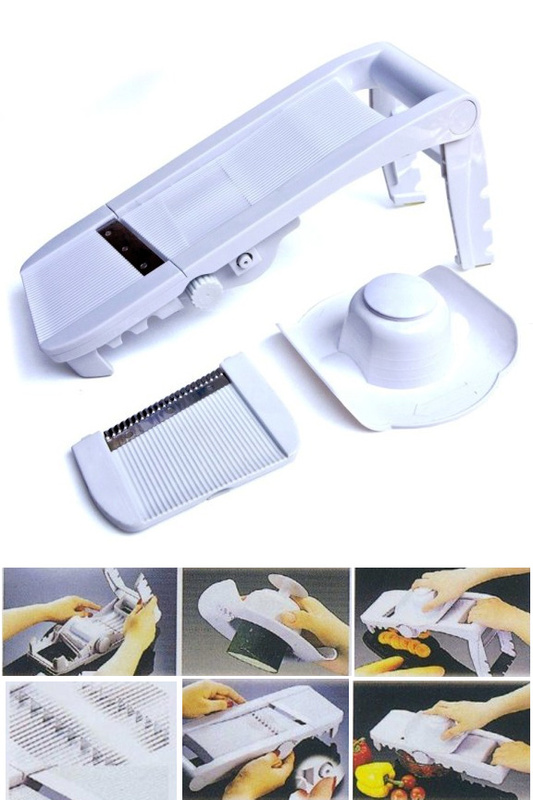 Slide back and forth to effortlessly chop any type of food. Mountable. Several cut-outs on the bottom allow you to attach it to a bowl or dish. Simply align the ideal notch with the edge of any container to stabilize and hold as you cut food that drops right into the dish. Deluxe. With fold down feet, a comfort grip handle, and a bonus waffle blade, this set has everything you need. Safe. Despite the dangerously sharp edges, this tool remains safe to use thanks to the included food holder. It will grip foods safely and securely and allow you to chop every last bit without risking a finger. Easy. Simple to set up, effortless to use, and incredibly easy to clean. You don't need to be a professional chef to use it, and you can toss it in the dishwasher for cleaning. Fast. Way faster than a knife, and quicker than other tools that are more difficult to use. Speed through any chopping job thanks to a quality design and dangerously sharp blades. Chopping carrot and celery sticks. Cutting toppings for burgers, pizzas or sandwiches. Dicing potatoes for home fries or shredding them for hash browns. Shredding veggies for salads, or making thicker sticks for garnish and stir fry. This incredible tool can handle all sorts of tasks. It will quickly become your favorite tool as it allows you to spend less time in the kitchen while you achieve better results, and accomplish more. Quickly slice tomatoes for sandwiches, shred cabbage for a salad, make stringy vegetables to use as pasta, chop carrot or celery sticks, give cucumbers a wavy texture, dice onions, make waffle, crinkle, or shoestring french fries, and so much more. With simple adjustments and a slight technique in some cases, you can prepare veggies like a pro. Speed up prep and make sure every piece looks the same. Follow the instructions below to learn how to master each feature of this powerful mandoline slicer. Cutting regular slices to a uniform thickness is simple. You can make each piece paper thin, or extra thick to suit your needs. To begin, make sure the straight blade is installed, and the tool is on a stable surface. Use the food holder to hold your vegetable by pressing the metal prongs into it. Turn the knob on the side to lower or raise the blade in order to select the thickness you want. To slice simply slide straight down and then use a back and forth motion. Use firm pressure to guarantee and even cut, and press the button on the food holder to reveal more as you cut what is visible. Continue slicing until you use all food. If you are not familiar, this style cut is when you end up with sticks. Use it for french fries, veggie sticks, shredded lettuce and other similar jobs. You will have two width options to choose from, and there is no blade to switch out, because they pop up instead. To select width and set up the tool, use the knob on the side to reveal the blades. Choose from 6mm or 9mm by leaving the small or large blades sticking up. You can also adjust height by using the other knob to raise or lower the horizontal blade. Ensure the slicer is secure and stable, then add your food to the holder. Slide straight down to cut and the vertical blades will slice length-wise while the horizontal blades cuts across at the desired height. With each pass, perfectly shaped sticks will drop out the bottom. Continue with a back and forth motion to cut the entire vegetable. As some gets used up, press at the top of the holder to reveal more. This is similar to julienne slicing, but with an added technique. When you rotate back and forth as you slice, it will cut small, uniform cubes instead of longer sticks. This is great for tomatoes and onions, and it creates a great presentation due to the perfectly sized pieces. Set it up just like the instructions above, and select your desired size by adjusting with the knobs. Secure your food in the holder and then slice by sliding down the face and across the blades. Once you make one pass, rotate 90 degrees, and then make another. After the second pass, rotate back 90 degrees, and slide it down again. Continue rocking back and forth, as you slice up and down and you will be able to chop up a pile of diced onions in a matter of seconds. 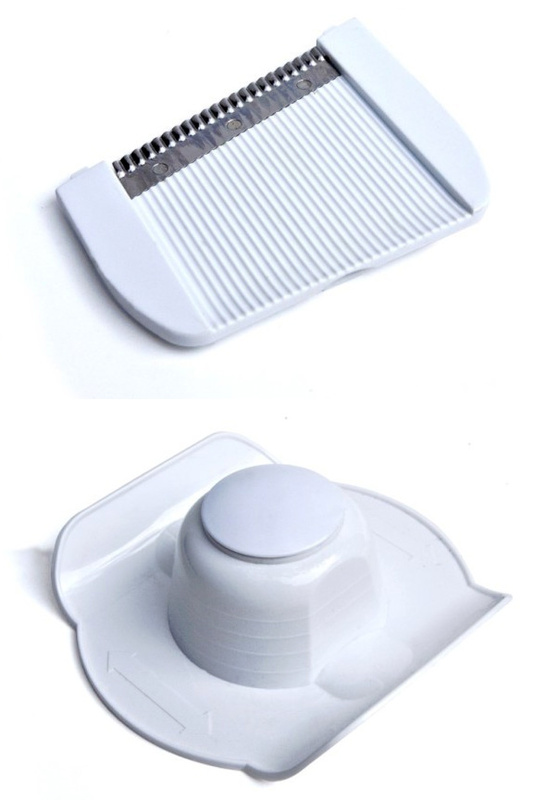 Easily cut wavy slices or waffle pieces with this extra blade. It replaces the straight blade, and is perfect for pickles, chips or waffle fries. Regular, back and forth slicing will produce a wavy disc in your choice of thickness, and with a slight technique you can slice holes in each piece to make them look like a waffle. Install the wavy blade, and use the side knob to adjust for thickness. Attach your food inside the holder, and slide down to cut. Slide up and down for evenly cut pieces with ridges on the top and bottom, or rotate with each pass to do a waffle cut. To get holes just rock back and forth with each up and down movement. Rotate 90 degrees, and then rotate back. In addition to the super sharp blade, this tool has several other advanced features that make it easy to use. Other slicers force you to support them with your hand. This one has built in options to reduce effort, and make it more simple to operate. A set of fold-out feet will stand it up at the perfect angle, but you can also mount it right on any bowl with the added notches on the bottom. It has a large, comfortable handle to ensure comfort and control, and the retractable blades improve safety, and simplify storage. With a range of thickness settings, and easy adjustment by turning a knob, this gadget offers everything you need to speed up cooking and food prep while improving your results. Stop chopping by hand, and don't waste money on more expensive options that do way less. Get this slicer instead, and save money without compromising ability, or reducing quality. With incredible accuracy, sharpness, and control, you will look like a pro each time you use it. Reduce any food to a pile of uniform pieces, and end up with better looking food in less than half the time. With a full range of settings, and the ability to thinly shave, or create large chunks, you are sure to get the results you want when using this tool. Wavy Blade Included - Use for wavy or waffle slices. Julienne Blades Included. Turn knob to hide or reveal. Blades pop up for use, and retract for safety and storage when finished. Adjustable Yes - Turn dial to raise or lower blade. Thickness Setting 0mm - 6mm Notches can be used as a guide to guage thickness, but you can set it to paper thin, or 1/4" thick, and anything in between. Legs Yes. Integrated legs fold out when needed. Bottom Notches Yes. Secure directly to a bowl for added convenience. A powerful slicer that does it all. With hidden blades and added attachments, it can cut french fries, veggie sticks, waffle fries, tomato slices, diced onions, shredded cabbage and more. Incredibly sharp and easy to use, with more thickness adjustments than most. Order Yours Today! I am extremely satisfied with this slicer! Great product for the minimal cost! My slicer is great I'm making all kinds of things like baked chips & apple galette it works just great can't wait to do some more!!! Does not make waffle fries like it advertised. Very disappointed. The box states that it dices but the item came with no instructions on how to do that. simplygoodstuff response: Dicing and waffle slicing both require a technique, but both are easy to accomplish. When dicing, you use one of the julienne inserts, and when waffling, you use the wavy insert. Hold your veggie at a 45 degree angle and slice straight down. Rotate 90 degrees and slice again. Now rotate back to the original position and slice again. Keep rocking back and forth while slicing to dice or waffle as expected. If you need more help, give us a call. Is the slicer able to dice vegetable too?